Imphal, Feb 14 (IANS) An improvised explosive device (IED) was found outside a school here on Thursday morning but it did not explode, police said. 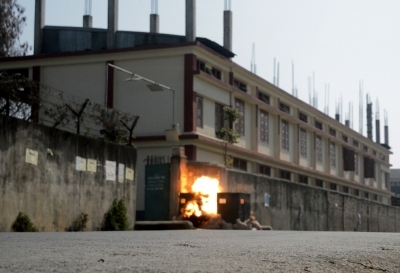 The IED was kept in a steel container outside the Catholic School in Canchipur area, adjacent to Manipur University. The bomb disposal squad made a controlled explosion in a paddy field nearby. Though no insurgent group claimed responsibility, security has been beefed up around the school, which was closed for the day. The school authorities have opposed the deployment of armed police and paramilitary personnel in its premises. Manipur's Christian missionary schools have been at the receiving end of insurgent groups in a bid to extort money.